As the normal business day came to an end and darkness fell upon us, there was an eerie sense of excitement in the air. It was a clear night and the perfect temperature for the annual gathering of Witches Night Out to summons the powers of darkness to wreak havoc upon Main Street Cold Spring Harbor. And that is exactly what happened. It was a fun filled night as ghoulfriends, witches and villagers filled the streets ready for whatever the local merchants were brewing up in their stores. 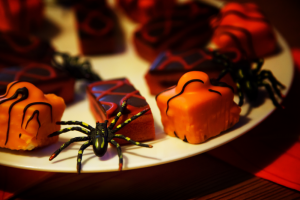 If you’ve never fallen under the spell cast by Witches Night Out Cold Spring Harbor, then you’re missing out on some really witchin’ good times! It’s a time when the town is safeguarded by the powerful white magic of a fangtastic coven of witches. Goblets filled with magic potions, tasty treats, psychic readings, games of chance and enchanting music are all part of the hocus pocus local merchants use to draw you into their quarters to show you a good time. No danger awaits you here . . . you’re sure to have a ghastly good time before the night is over and forever under the spell of returning year after year. Below are some highlights of the evening. Watch it and enjoy!